represents to sociology and behavioral science what the Quantum Theory and The Theory of Relativity are to physical science. The basic principles of the Three-Dimensional Model are readily understood by the general public as well as behavioral scientists. The Model has importance to real-life situations and daily activity of most readers. More information is available in the book and the U.S. Patent. A fresh, scientific approach to the study of human behavior without putting readers to sleep. 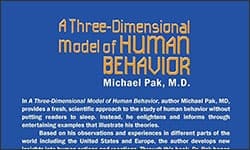 In A Three-Dimensional Model of Human Behavior, author Michael Pak, MD, provides a fresh, scientific approach to the study of human behavior without putting readers to sleep. Instead, he enlightens and informs through entertaining examples that illustrate his theories. 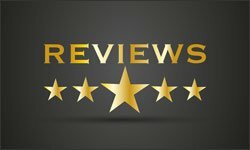 Based on his observations and experiences in different parts of the world including the United States and Europe, the author develops new insights into human actions and reactions. Through this book, Dr. Pak hopes to help the public better understand various forms of human behavior and, consequently, become better prepared to analyze them and appropriately respond. To communicate his theories, the author uses fictitious characters who illustrate various modes of behavior. Among them are a basketball coach who continuously fights negative publicity concerning his controversial behavior; Salien, a member of a futuristic Martian society, composed of immigrants from Earth, which exhibits familiar cultural biases; and a soldier from a Marxist revolution who finds himself falsely accused by the culture he helped to create. In short, Pak’s book offers something for everyone. Students of the behavioral sciences will find an enlightened and informed view of interactive behavior, which is systematically demonstrated and linearly displayed. Those with a cursory interest in human behavior will be both informed and entertained. This book is based on (or related to) the United States Patent 6581037 for human behavior analysis (the only patent of its kind). Available at www.uspto.gov. 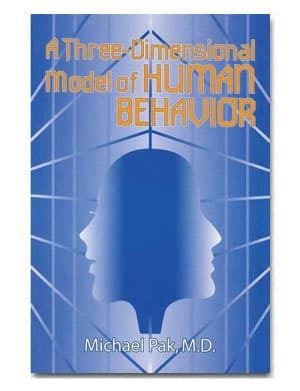 If you want to understand and influence human behavior, whether you’re a student, teacher, scientist, diplomat, social activist, psychologist, M.D., politician, or just want to change your community for the better, you need to read "A Three Dimensional Model of Human Behavior" by Michael Pak, M.D. – the only book about predicting human behavior based on a U.S. Patent (2003).